Beijing has ordered the closure of cinemas, theatres, karaoke bars and internet cafes in an effort to stop the spread of the pneumonia-like Sars virus, China's official media has reported. The Xinhua news agency said "all entertainment businesses involving mass public gatherings" would remain closed until the outbreak of Severe Acute Respiratory Syndrome is brought under control. On Sunday Hong Kong's health department announced another 12 deaths, taking its total death toll to 133. China announced nine further deaths. And Taiwan announced tough new quarantine rules after a middle-aged man who caught the disease from a brother visiting from Hong Kong became the first to die from the illness on the island. The wave of criticism of China's handling of Sars has now also led to the resignation of Health Minister Zhang Wenkang, China's Xinhua official news agency reported. US President George W Bush spoke by telephone to Chinese Premier Hu Jintao, and offered condolences to the families of those who have died from the Sars virus. He said the US would offer "assistance" to China, if required. Regional efforts to combat the disease took a step forward on Saturday, as health ministers from east Asia met in the Malaysian capital Kuala Lumpur. They agreed there is a need for compulsory screening of passengers leaving their countries, but did not agree on common procedures. 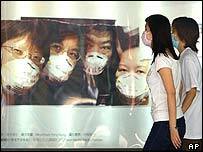 Canada, the only country outside Asia to have been badly hit by Sars, sent observers to the meeting. A 77-year-old man died of the disease in Toronto on Saturday. He was the husband of a health care worker who had contracted the disease earlier. But a World Health Organization (WHO) spokesman said the body was considering lifting its advice against travel to Toronto, where all of Canada's Sars deaths have occurred. The Asian health ministers said in a statement they were "convinced of the effectiveness of screening of passengers before they leave affected areas in preventing the spread of Sars". "Even one single infectious case can lead into a serious outbreak unless rigorous measures are taken," they said. Earlier, a WHO official said the countries had to be "absolutely relentless" in the fight against Sars. Authorities in Taiwan announced a mandatory 10-day quarantine period for those arriving from areas badly hit by Sars after the island suffered its first death from the illness. Foreign visitors would be placed in unspecified government-designated quarters, while Taiwanese would have to stay at home - or face hefty fines or jail terms of up to two years. In China, the Sars crisis continued to intensify with the resignation of Health Minister Zhang. 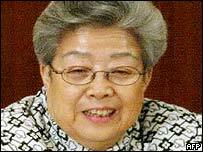 He has been replaced by Vice Premier Wu Yi - the most senior woman in Chinese politics and an internationally respected stateswoman. Her appointment, says our correspondent Francis Markus, indicates how seriously authorities are taking the situation. Nine new deaths in China took the death toll there on Sunday to 131, said the health ministry, with an additional 161 new cases. Hong Kong marked 12 new deaths on Sunday - double the six announced on Saturday. Two health workers are among 16 new cases, it said. Those who died on Saturday included a 28-year-old man, believed to be a computer engineer who lived in Kowloon - the youngest victim in the territory so far. His girlfriend told a local newspaper that his symptoms were minor at first, but his condition deteriorated earlier this month. A BBC correspondent there says health officials are particularly concerned about the spread of Sars in the Amoy Gardens area, where the man lived. Several cases are reported among people who had had no contact with other Sars patients. A leading UK authority on infectious diseases in Hong Kong may amplify concerns when he completes a study of the outbreak. Professor Roy Anderson, from Imperial College London, is carrying out the first detailed analysis of the spread of the virus there. His study is expected to show that the virus has a higher death rate than the 5% previously estimated by the WHO. "In China...the authorities are getting even tougher in their fight against the illness"